Looking for A Music Class for Your 4 ½ To 7 Year Old? Kindermusik for The Young Child Is the Answer! Kindermusik for the Young Child is the capstone of the Kindermusik continuum. We nurture your child’s love of music in these classes. And, being that the learning takes place in a social environment, the learning is fun! What My Child Will Learn: During the first year your child learns to read notes on the treble clef staff and to play these notes on their instrument, the glockenspiel. The glockenspiel is a type of xylophone that is similar to the piano keyboard minus the black keys. 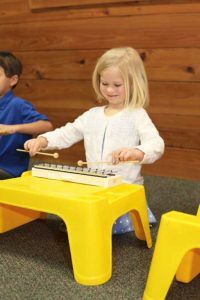 The second year your child continues to play the glockenspiel, but they also learn to play the dulcimer (a string folk instrument), and a recorder. In Kindermusik for the Young Child, Students Experience a Percussion Instrument, a String Instrument, and a Wind Instrument. With this type of learning your child will be soaring in piano or any instrument they study after graduating from Kindermusik because the ground work has been laid. In other words, the neural connections have been created. In Addition to Note Reading and Playing Instruments, your child will move, dance, sing, create ensembles, study famous composers, and learn about the 4 instrument families. During these one hour classes your child will be immersed in music. You will see your child blossom in so many ways: cognitively, socially, physically, and emotionally. And, You Are Involved Every Step of The Way. You are invited into the classroom for the last ten minutes of every class. You will know exactly how to help continue the learning at home during the week. Won’t your child join us? Classes start September 11th.